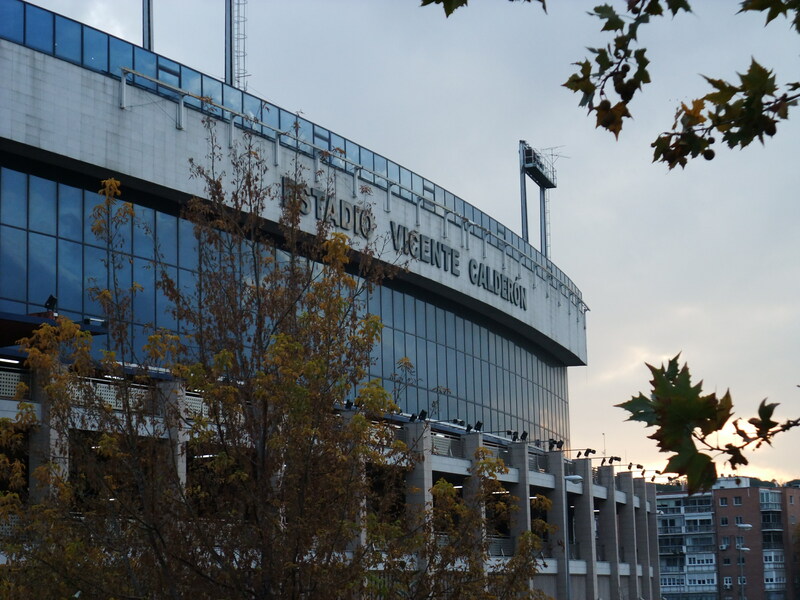 Having thoroughly enjoyed the spectacle and the atmosphere of going to the Vicente Calderon on Sunday, the match itself was also rather entertaining. Atletico of course came into this one sitting 5 points ahead of city rivals Real, and only 3 behind league leaders Barcelona. Atleti, therefore, had some not entirely misplaced confidence coming into this match, the one slight doubt being the (for his standards) slightly patchy form of Falcao, their star Colombian striker. Sevilla were likely to provide a stern test, with the home side’s record against their Andlusian opponents being sketchy over the last few years. To the match itself, and the opening 19 minutes were largely taken up by sparring, with neither side seemingly willing or able to take the initiative. Sevilla’s game-plan from the start seemed to have been based on getting as many men as possible as tight as possible on Falcao and stop the creative flow, and for a time this worked perfectly. The game changed rather dramatically on 19 minutes, however when Falcao and then Koke attempted to waltz fairly clumsily through the Sevilla penalty box. Federico Fazio took down the young Spaniard and was shown a straight red card for his troubles. Falcao cooly dispatched the penalty high into the back of Andres Palop’s net to give Los Colchoneros the lead and end his mini-drought of three whole games without a goal. Sevilla then proceeded to stick to their original plan until the 40th minute, when Atletico doubled their lead. A cracking ball out of defence from Diego Godin was beautifully controlled by Falcao, who had found some space in the middle of the park following a Sevilla set piece. He chested and turned in one movement, and after running swiftly through the makeshift away defence very unselfishly slid the ball through to Arda Turan, who slipped the ball under Palop via a Spahic deflection into the net. Four minutes later and the game was as good as over as the Rojiblancos notched a third. Tireless running from Diego Costa, harrying the Sevilla left back and then bolting down the right, found the Brazilian in a good crossing position. He picked out the onrushing Koke perfectly, the young midfielder knocking it home at the back post for 3-0. Onto the second half , and it was a little bit of a non-event in football terms. Diego Costa wasted a couple of good goalscoring opportunities through ropey decision making on the hour mark, firstly taking it on himself when he should have played in Falcao (he did hit the bar from this chance but only via a bizarre deflection), and then dithering a bit at the near post when again he had the should have given the Colombian a goalscoring opportunity. After Costa’s apparent wastefulness, the match again entered a “sparring” phase, with neither side expending a great deal of energy, and a number of substitutions served to break up the game further. The last 10 minutes or so, however, provided a further slice of tasty action. On 79 minutes, unused substitute Antonio Luna was shown a red card, presumably for naughty language directed at the slightly harrassed referee. His scarlet-coloured card came out again a few minutes later, this time following a second yellow for Croatian midfielder Ivan Rakitic who had probably been Sevilla’s most effective player on the night. There was still time for a fourth goal, and it came two minutes into stoppage time. A speculative effort from the edge of the area by the excellent Atleti left-back Felipe Luis was spilled by Palop; Turan found himself some space to cut the ball back to Miranda who couldn’t miss. 4-0 to Atletico, and thoroughly deserved it was too. The final whistle sounded an excellent result for Atletico, and a real fillip for manager Diego Simeone ahead of their trip to Real Madrid for “El Derbi” this weekend. In all, Atletico put in a fantastic performance,and deservedly go into Saturday night’s match 8 points ahead of their city rivals. Real might not have it their own way if Atleti play like they did on Sunday. A street of prostitutes. That was mine and Clare’s (my girlfriend) introduction to Madrid last Friday night, as we strolled down Calle de Montera from Gran Via metro station to our hotel. Our first impression of the Spanish capital was of a wild, slightly unnerving city. I hoped that I hadn’t let us in for something similarly wild and unnerving for the Sunday evening. 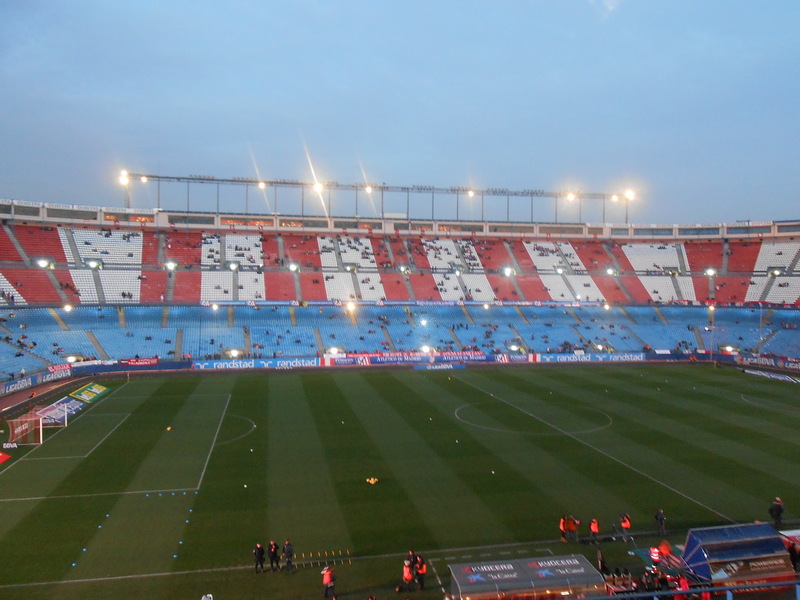 That particular evening involved a jaunt to the south of the city, and the Estadio Vicente Calderon, to see Atletico Madrid play Sevilla (I’ll cover the game itself in a separate blog post). When Sunday came round, we left the city centre (Plaza de Oriente) early to soak up some pre-match atmosphere. Kick-off was at 7pm, but as we made our way along the Calle de Toledo (Toledo Street) at 4:30, there was a fair number of Atleti fans doing exactly the same. By the time we were nearing the ground itself, the surrounding bars were packed with supporters of Los Colchoneros (the Mattress-Makers), most of them watching Fernando Alonso in the final grand prix of the season and supping a pre-match beer. On arriving at the stadium itself, from the outside it appeared to be a pretty impressive beast, all smoked glass and reinforced concrete. 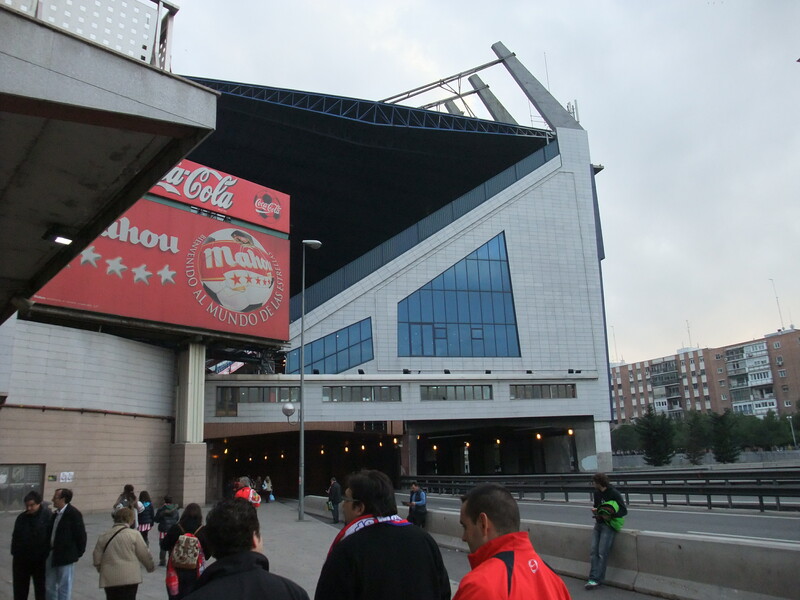 One particularly interesting quirk of the Calderon is that the main stand (where we would end up to watch the match) sits over the M30 (the Madrid equivalent of the M25) and indeed has its own slip road off the motorway for the team bus. The Main Stand, over the private slip road (left) and the M30 (right). We moseyed round, along the motorway slip-road, to the excellent club shop, where something in Clare’s handbag sent their security system a bit wild, and I got myself an official scarf. At 6 we then decided enough was enough and it was time to head in through Puerta Cinco (5) to our seats in the Main Stand (La Preferencia). Inside, the stadium perhaps looks a little tired, with no roof on three sides and La Preferencia itself looking its 40 years. Still, I liked the fact they had red and white seats in the upper tiers and blue in the lower – shirt and shorts. The “shirt and shorts” look. Soon the players came out to warm up, and then the Ultras (sometimes controversial, and the weekend was no exception) came to life, booing the Sevilla players as they came on for their final preparations. 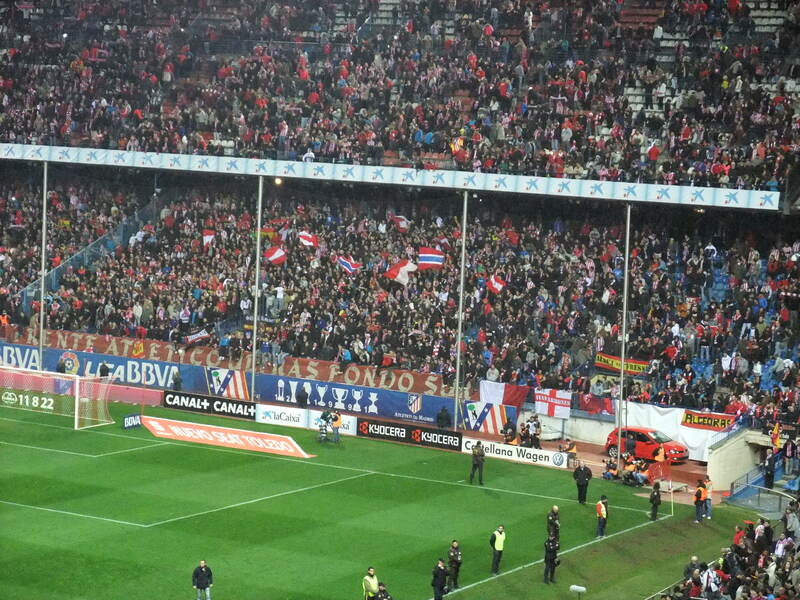 It was a cracking bit of gamesmanship by Atleti, in fact – the Sevilla players had to warm up next to the Ultras, while the home players were able to calmly warm up next to the (at that point) mostly empty Preferencia and the Fondo Norte (north stand). At this point, we got our first glimpse of the home fans’ current hero, Colombian striker Radamel Falcao Garcia (usually just “Falcao”), warming up alongside his teammates. They went through a number of someone interesting contortions until five minutes or so before kick-off. At this point, the Ultras unveiled their piece de resistance – an enormous banner reading “Glory is Achieved Through Fighting”. The noise then began to rise and the old heart was starting to pound a bit. Bayview on a dreich Saturday afternoon in Fife this was not. 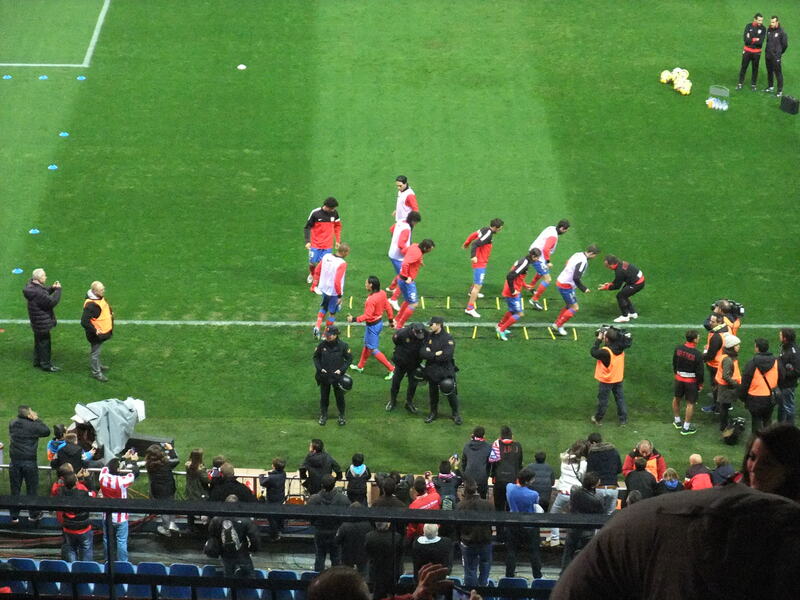 The Atletico players in the final stages of their pre-match warm-up, with Falcao the closest player to the camera. The Ultras continued in that vein for much of the match, though without the slightly sinister banner. They were noisy, passionate and took the rest of the stadium with them. Having watched Spanish football on the telly for years, my desire to shout “Golllll!” rather than “Yeeessssss!” was soon fulfilled, along with singing “Gollllllll, Gollllll” to “7 Nation Army” by the White Stripes. The Ultras had quite the repertoire – it was only after the game that I discovered part of that repertoire involved asking Jose Antonio Reyes (current Sevilla and former Atletico player) to kill himself. Not so good. 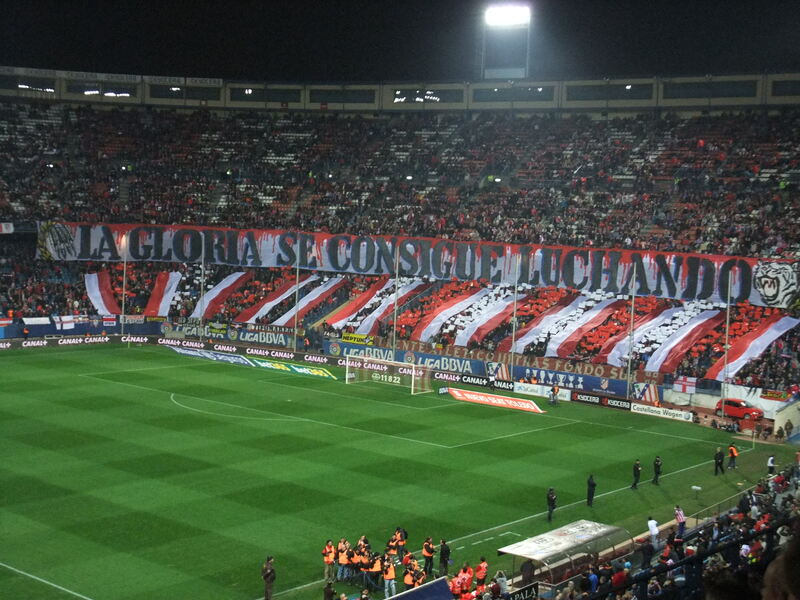 “Glory is Achieved Through Fighting”, according to the Atleti Ultras (with thanks to madridatleticos.com for the translation). As well as the fantastic atmosphere created by the self-styled “bad boys” in the South Stand, what also struck Clare and me was that, certainly in our stand, going to the game was very much a family pastime and something to be enjoyed civilly by both men and women. Old boys and their grandsons turned up and embraced one another whenever the home side scored. A chap wearing yellow chinos and a body warmer was quite happily playing about with his iPad and puffing on a Cuban cigar for the entire game. At half time, having munched on sunflower seeds for the first half, the family sitting next to us brought out their foil-wrapped pieces ready to settle in for the second 45. Nobody batted an eyelid when some kids a few rows back came several forward for the second half to get a better view of their heroes. I can’t imagine any of this happening too readily at most grounds in Scotland (the last point in part, admittedly, because Rock Steady and their ilk would be in there before you could say “but these seats were empty”). In all, the Spanish football experience was an eye-opening one. The atmosphere and the camaraderie was palpable, the rest of the ground being led on by the irrepressible Ultras. That said, there was a friendly collective feel to proceedings – the crowd quite easily dissipated back up to the Puerta de Toledo and the city centre once the 90 minutes were up. So much for being wild and unnerving. Friends of mine will know of my tendency to send seemingly punty e-mails from time to time. As an example of this, last year I found out that the Methil power station chimney (an architectural beast which overlooked the town I grew up in) was being demolished on my birthday. Carefully choosing the most likely Scottish Power e-mail address from their website, I asked very nicely if, given my ties with the area and my 20 years of non-stop East Fife (my team and the local football club) support, I could press the button which would send the chimney into oblivion. Of course, no-one ever got back to me, and for some reason instead it was people who had worked in the power station for 20+ years who got to flick the switch and send that tubular lump of concrete flying. I made a similar punt about two months ago when I looked to see if any of East Fife’s Trinidadian signings in the mid-1990s were easily contactable, having been inspired by a wonderful article on tellhimhespele.com. Gavin Lewis and Arnold Dwarika were nowhere to be found – Craig Demmin, a strapping centre-half who played 9 league matches for the Fifers during Steve Archibald’s all-too-brief reign, however, had a website with a contact form… it was worth a go. I asked him if he’d heard much of his fellow countrymen, and whether or not he’d mind being the subject of a future blog post. I expected a response similar to the one I’d had from Scottish Power. However, a few days later, I was surprised and delighted to receive a response from the man himself, saying he’d be happy to answer any questions I might have, that he hadn’t seen or heard much of Lewis or Dwarika in recent years, and that he liked my blog (had to get that in). After attempting to cobble some questions together over a couple of weeks, I sent them on to Craig via e-mail, who very graciously responded. To give some background on Mr Demmin, Craig started his career in Trinidadian league football, playing for Trinity Pros before moving to Scotland and Methil to play for East Fife. After his time in Scotland he moved to the United States, the highlight being his spell with Tampa Bay Mutiny in Major League Soccer. He also spent 7 years in total at Rochester Raging Rhinos in the A-League/USL (at the time, the US Second Division), making over 100 appearances for the club. He pulled on the Trinidad and Tobago shirt 25 times. 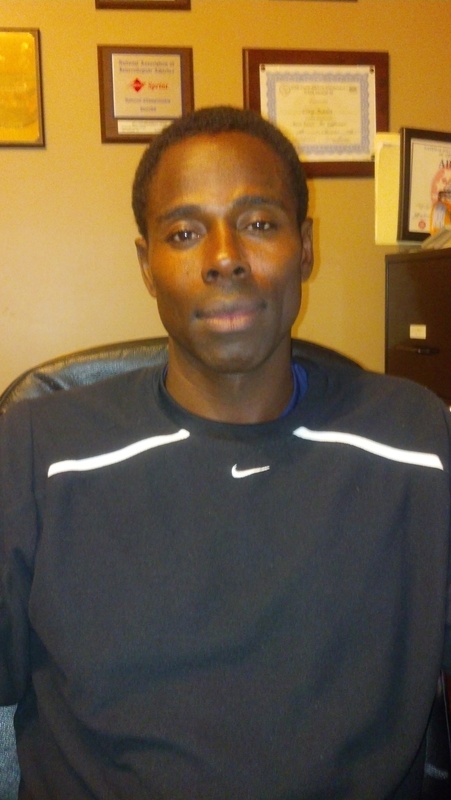 He now lives in Rochester, New York with his wife and two sons, and runs soccer camps for local children which see 250-300 participants every year. Firstly, Craig, why did you choose to come to Scotland to further your career? My fellow countryman (Arnold Dwarika) was at East Fife at the time and from what I heard from him, I was excited about the opportunity and the experience that playing in Scotland would bring. That made it an easy decision for me. Having Arnold (Dwarika) in Methil is what initially brought me to East Fife. Before that I knew nothing about the club. I was very excited to see when I got to the club that Steve Archibald was the player/manager. I grew up being a big fan of Tottenham Hotspur and Steve Archibald was one of my favourite players. What did you think of Methil and Fife in general? I really enjoyed it. I loved the small town atmosphere. We lived a couple of blocks away from Bayview Park. I remember going for early morning runs along the water and walks through the town centre that always seemed busy with people. Did you feel like the move to East Fife was a step up compared to your time in Trinidad and Tobago? Yes, it was a step in the right direction for me. It was a different game compared with college in the USA, and at that point of course Trinidad and Tobago didn’t have a professional league. East Fife played Trinidad and Tobago in a friendly while you were in Methil; how strange was that for you? It was a wonderful experience. Although it wasn’t the full national team, it was great to see fellow Trinidadians get some exposure abroad. Did having an established fellow countryman in Arnold Dwarika in the side help? Did he help sell the club to you? It did, and he did! He was a well-respected player in both Trinidad and the wider Caribbean. What sticks in your mind most from your time at East Fife? The little flat we lived in, the little corner shop nearby that we sometimes visited as many as 3 times a day, and of course the passionate fans. What did you make of Steve Archibald as a manager? Steve Archibald was a player I always looked up to. I never thought I’d get the opportunity to meet him! He was a real player’s coach and all the players seemed to have the same degree of respect for him. There’s always something exciting about signing a foreign player for a fan of a Scottish lower league side. Did you pick up on that from the East Fife supporters? I did. I think Arnold set the tone for me being at the club on that front in particular. He was really respected by both the fans and the players. What path did your career take after you left East Fife? Do you feel your time at the club helped your future career? My time at East Fife really did help me for what I accomplished later in my career – my experience at the club was invaluable. It wasn’t always easy – I really struggled with recurring injuries while I was at East Fife. I think the old saying “what doesn’t hurt you, makes you stronger” really applies to my career. 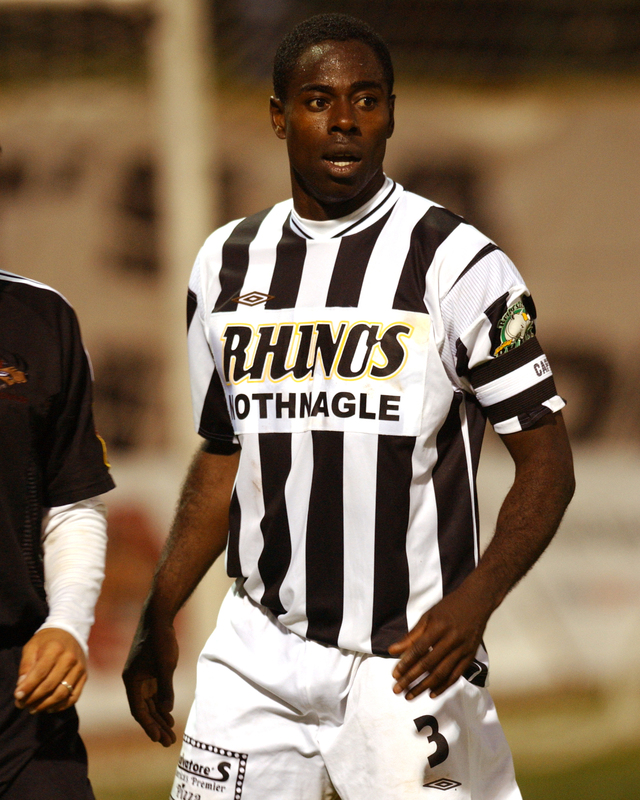 I later played in the USA with Rochester Rhinos in the A-League (now the USL, at the time the US second division) and Tampa Bay Mutiny (in the MLS). I also continued to play for Trinidad and Tobago for three years after leaving Scotland. Do you have any regrets about your time at East Fife? Would you liked to have stayed longer? I don’t have any regrets at all – I think everything happens for a reason. I still have the fun memories to keep with me. I hope that one day I can make a trip back to Fife with my wife and my two boys. What is the proudest moment of your career overall? There’s not one specific moment I would pick above all the others. My time at East Fife, although it was short-lived, is still a really important part of my career. Every time I wore the Trinidad and Tobago shirt, from youth to senior level, and being part of college and professional championship winning teams in the US were all fantastic moments. Why do you think we don’t see more Caribbean footballers in the UK? I think now is a good time for Caribbean footballers generally – there is a fair amount of Caribbean players at various levels in the UK. Now, more so than ever, Caribbean players are having opportunities to go to other countries and make a living playing the game. You mentioned that you haven’t heard from Arnold Dwarika or Gavin Lewis in a while – do you keep up with any other Trinidadians who played in Scotland? For example, Russell Latapy, Jerren Nixon, Tony Rougier? I keep up through the internet and through mutual friends. Russell Latapy had a stint as head coach of the Trinidad and Tobago national team. Tony Rougier was with me at Rochester Rhinos, he’s now back in Trinidad and very much involved in football. What is the standard of football in the Caribbean at the moment, and Trinidad and Tobago in particular? Should more football scouts and agents from the UK go to the Caribbean to pick up players? I think at the moment football in Trinidad and Tobago football has slowed down since the high point of World Cup qualification in 2006. There’s a lot of work being done at the moment to get us back to where we were a few years ago. We still have many talented young players who are eager to display their ability to teams in the UK. What do you think of your fellow countryman Mr Jack Warner and his time in charge of CONCACAF and the Caribbean Football Union? Mr Warner has done a many great things for football in Trinidad and Tobago and the region. It’s sad to see the manner in which his reign came to an end. I notice from your website you now run soccer camps in the United States. How much do you get out of passing your skills and experience on to the next generation of footballers? How many kids you see come through your camps every year? Has MLS and the like helped the enthusiasm for football in the USA? Fortunately, there are lots of kids playing soccer in the US today. I would say that soccer is one of the more popular sports for kids. Having played for a number of years here in Rochester, it was an easy choice to stay here and get involve in coaching. Every year I have about 250-300 kids come through my camps and it’s great to see them enjoying soccer as much as they do. MLS has continued to improve and provide a standard of soccer that will, I think, lead to a brighter future for the sport in the US. I think also the influx of top European teams making trips to the US for pre-season tournaments and the availability of top world class soccer on the TV and other media has also helped in promoting the game in the US. Do you think the men’s team in the USA could match the women’s eventually and win a World Cup? I hope so, but it’s going to be difficult. In the men’s side of things, soccer has continue to improve but still soccer to America is not what soccer is to Brazil, Spain or Argentina, for example, where the game is a way of life, a religion. How the rest of the world views soccer resembles how the mass public in the US view American Football, Basketball or Baseball.